The highlight of the Infinix Hot 4 Pro smartphone is its camera and battery life. It was launched in August 2017. The smartphone features 5.5-inch HD display with 1280 x 720 pixels resolutions. It runs on latest Android Marshmallow 6.0 operating system with 4G VoLTE support out of the box. The device is powered by good 4000mah non-removable battery. The smartphone is powered by a Mediatek MT6737 Quad Core processor with 1.3 GHz octa-core. Infinix Hot 4 Pro is packed with a 13MP Rear Camera and 5MP Front Camera. In the box, you will get Handset, AC Adapter, Battery, USB Cable, and User Manual. The Infinix Hot 4 Pro has a dimension of 152.60 x 76.20 x 8.80 (mm) and weighs 175.00 grams. The smartphone is a Dual Sim (GSM+CDMA and GSM+CDMA) phone which accepts Micro-SIM for both the slots. It has a dedicated SIM slot design, so you can have dual SIM along with additional memory card expandable up to 128GB. The Infinix Hot 4 Pro features 5.50 inches (13.97 cm) IPS Display with the resolutions of 1280 x 720 pixels. The Infinix Hot 4 Pro is good value for money phone. It is powered by a Mediatek MT6737 Quad Core processor with 1.3 GHz octa-core, which is good enough to play high-end gaming like Asphalt 8, watching videos and browsing seamlessly. It comes with 3GB RAM and 16GB ROM combination of Magic Gold and Quartz Black color. The device runs on latest Android Marshmallow 6.0 operating system out of the box. The Infinix Hot 4 Pro is powered by a large 4000mah non-removable battery which can offer 18 hours of video playback and 12 hours of gaming time. Infinix Hot 4 Pro support 4G network with 4G LTE with VoLTE out of the box. It includes connectivity options such as Dual Sim (4G VOLTE), Wi-Fi 802.11 a/b/g/n, hotspot, Bluetooth 4.1, microSD, and USB Port. Most of the major sensors are available in the device such as the G-sensor, Light Sensor, E-compass, Proximity Sensor, Fingerprint Sensor. 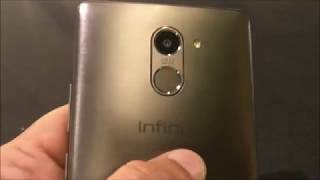 Infinix Hot 4 Pro sport a 13MP Rear Camera and 5MP Front Camera. Rear camera sport 1.4-micrometer pixels and 1.12 micrometer in front camera. The smartphone consists many important features like Fixed Focus and maximum pixels of 4864 x 2736 for the rear camera. And what makes it different from other smartphone is that it has LED flash for both cameras. 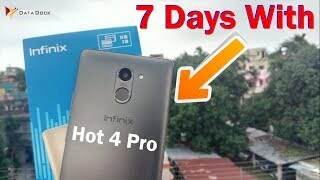 The lowest price of Infinix Hot 4 Pro (Quartz Black, 16 GB)(3 GB RAM) was obtained on April 15, 2019 1:18 pm. Average phone but good battery backup.